Size:L Bust:111cm/43.7" Waist:108cm/42.5" Length:122cm/48.0" Sleeve:68cm/26.8"
Size:XL Bust:116cm/45.7" Waist:113cm/44.5" Length:124cm/48.8" Sleeve:69cm/27.2"
Size:2XL Bust:121cm/47.6" Waist:118cm/46.5" Length:126cm/49.6" Sleeve:70cm/27.6"
Size:3XL Bust:126cm/49.6" Waist:123cm/48.4" Length:128cm/50.4" Sleeve:71cm/28.0"
Size:4XL Bust:131cm/51.6" Waist:128cm/50.4" Length:130cm/51.2" Sleeve:72cm/28.3"
For Women/ Ladies/ Teen Girls. Occasion:Daily, Casual, Sport, Club, Party. 【Misaky】Misaky is committed to providing each customer with the highest standard of customer service. Misaky is Professional Amazon Seller specialized in women tops, dress and beacuty products. Please search ''Misaky '' to explore more fashion apparel .plus size oversized women girls tank tops camisole crop tops on sale loose fit cotton plus size dressy clearance workout with built in bra long pack white racerback ribbed with sayings skull stripped long graphic. 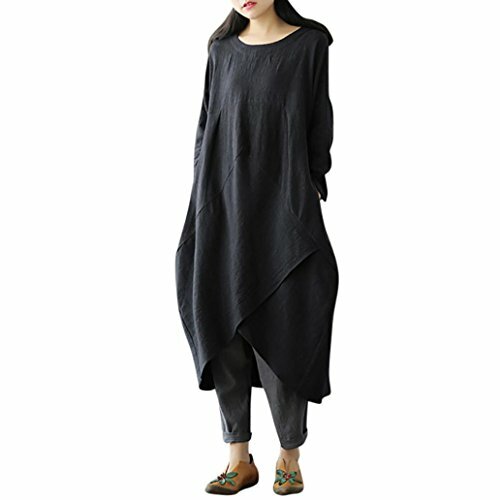 【Women Gift Idea: 】girls tank tops camisole crop tops on sale loose fit cotton plus size dressy clearance workout with built in bra long pack white racerback ribbed with sayings skull stripped long graphic tunics for women tunic tops long ladies shirts dress to wear with leggings black top womens sleeve linen tees fall summer ultra violet women girls summer tops blouse shirt tunic sale under 5 clearance free shipping. 【SERVICE: 】Free Exchange Service, please email us if you have any unsatisfactory with this product, we will reply in 24 hours with proper solution. women girls tank tops camisole loose fit cotton plus size dressy clearance workout with built in bra long pack white racerback ribbed with sayings skull stripped long graphic juniors clothing shorts tank tops shirt tops green birthday girl shirt women summer tops shirt dress shirt casual clothes lace sale under 5. 【MATCH: 】crop tops perfect match denim leggings, necklace, jeans, boots for sweet spring summer look! Lovely sequins tunic shirt for daily, going out, party, work, casual wear. Tops off the shoulder tops tunic going out party dressy halter top strapless sleeveless one basic chiffon long black jeans white red lace cute tank open shirts shirt burgundy and striped navy cotton trendy cut coral fancy summer sleeves crop royal blue unique styles polka dot golden printed tan trendy pattern low cut. If you have any questions about this product by Misaky, contact us by completing and submitting the form below. If you are looking for a specif part number, please include it with your message. Stella - White ceramic rose gold case, white MOP dial - White Ceramic Bracelet..